An enduring audience favourite for several decades, Mahler’s Symphony No. 5 continues to maintain a firm hold in the concert repertoire with a profusion of choice in the record catalogues. A work that can make a deep emotional impression, I still affectionately recall an Olympian performance of Symphony No. 5 I attended in 2011 in Berlin by the Pittsburgh Symphony Orchestra under Manfred Honeck. Notably the performance from the American orchestra, given on the actual day of the 10th anniversary of the 9/11 terrorist attack on the Twin Towers of the New York’s World Trade Centre, contained extra poignancy. This new release of Mahler’s Symphony No. 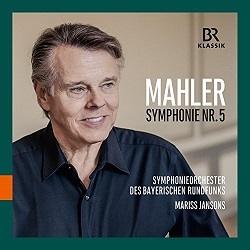 5 comes as something of a surprise, since the BR Klassik label have already released a live account of the work (albeit with a limited circulation) also with Symphonieorchester des Bayerischen Rundfunks under Mariss Jansons recorded live in March 2006. With his new release Jansons responds to the multifarious moods of Mahler’s Symphony, giving a majestic account that provides absorbing drama. From start to finish the Latvian maestro communicates a judicious balance between impressive intensity and attention to the overall structure of the score. Commencing with a stunning trumpet solo in the opening of the beautifully paced ‘Trauermarsch’ (Funeral March), a sense of nightmarish expression and weight of spectacular orchestral sound sends a shiver down the spine. Almost immediately one becomes conscious of the exceptional condition of the brass, with the strings also radiating a glorious bloom. Such a magnificent creation; in the tempestuous second movement who could fail to be impressed by the playing, which swells gloriously from uplifting pastoral scenes into determined anguished climaxes? The overtly pictorial Scherzo feels like squally, open air music, a refreshing stride through verdant Alpine vistas with Jansons communicating stunning sights and sounds, including folk dance melodies, along the route, with absorbing clarity. One could almost be reading intimate pages from Mahler’s holiday diary. Especially striking is the wonderful horn playing and the distinctive rich firm tone of the cellos. With his conviction at an absolute zenith, Jansons directs a climax that feels crushing in terms of exhilaration, volume and force, almost pinning me back in my seat. Mahler’s declaration of his deep love for his wife Alma, the justly famous Adagietto, is exquisitely played with a level of restrained passion that could break the stoniest of hearts. Imbued with a swirling, near dizzying quality and varying weight, the Rondo-Finale Allegro generates considerable excitement. In the rumbustious final pages the reserves of sheer energy that Jansons demands from his receptive Munich players are potently produced. With playing of elevated quality from the world class Symphonieorchester des Bayerischen Rundfunks under Mariss Jansons this captivating live account is one of the finest in the catalogue. Unquestionably I will play this new Jansons recording often but will probably continue to reach first for my treasured live 1981 Herkulessaal, Munich account from Rafael Kubelik and the Symphonieorchester des Bayerischen Rundfunks on Audite.